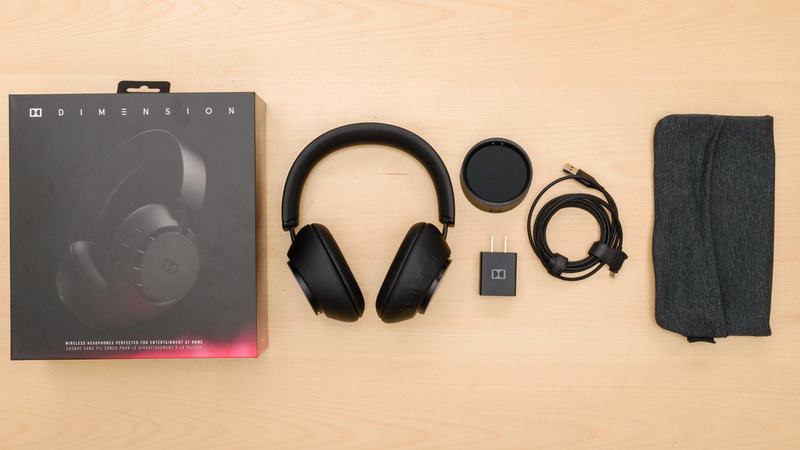 The Dolby Dimension are decent, mixed-usage, over-ear headphones that are fairly versatile for everyday casual use and can also be used for watching TV if you have the appropriate low-latency (aptX-LL) dongle. These headphones are comfortable to wear for hours and feel very solid. They look and feel like premium headphones, but their ANC feature is disappointing when compared to similar high-end headphones. They have nice virtualization and head tracking features, but if you don’t care much for this, they might not be worth the investment. Virtualization and head tracking features. Lackluster app with few customization options. Bass delivery varies across users. Sensitive to glasses. The Dolby Dimension are very well-built headphones that have a high-end look and feel. They are very comfortable to wear for hours, and their overall build feels solid. They also have a responsive and accurate touch-sensitive control scheme that is easy to use. Unfortunately, like most over-ears, they aren’t very breathable and won’t be the best option for sports, although they have a stable fit. They come with a charging dock that you can put next to your main power source for aesthetic purposes, but you can also only use the micro-USB cable to charge the headphones. The Dolby Dimension are sleek-looking headphones. They are mostly made out of metal and covered in leather, which gives them a high-end look. The backing of the ear cups is flat and acts as a touch-sensitive surface with the Dolby logo. The padding on the cups isn’t that thick, but the leather covering the cups makes it look like it is. The headband is well-padded, and a thin sheet of metal covers it, finishing the whole design with a premium look. The Dolby Dimension are very comfortable headphones that you can wear for hours without feeling any soreness. They are on par with the Bose QuietComfort 35 II and feel very lightweight once on the head. The cups are well-padded, large enough to fit most ears without them touching the drivers. The headband has great padding as well and helps distribute the weight evenly on your head, without applying too much pressure. 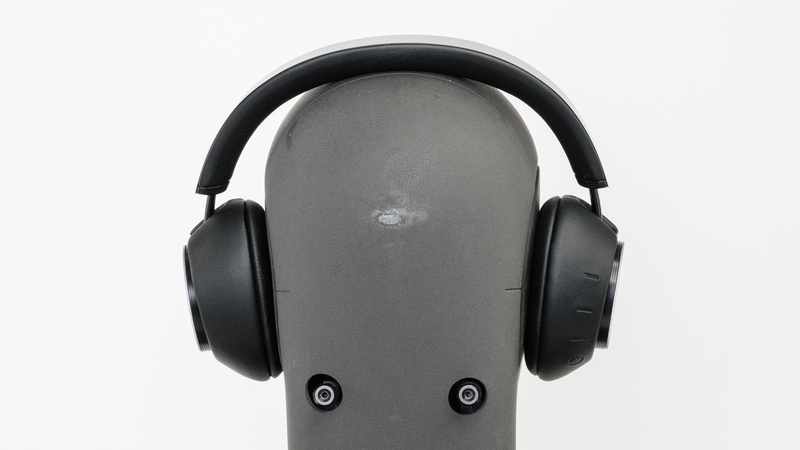 These headphones have a touch-sensitive control scheme on their right ear cup. It is one of the most responsive and accurate touch-sensitive surfaces we’ve used so far. You can easily swipe up and down to control the volume and swipe left and right to skip tracks. A single tap plays/pauses your music and lets you answer calls as well. You can also double-tap the surface to enable transparency mode, which is basically talk-through, and triggers your device’s voice assistant. Unfortunately, you don’t have any control over the ANC level. On the upside, you also have access to 3 physical buttons that can each be mapped to 3 different devices to easily switch between sources. Note that, like the Sony WH-1000XM3, their touch-sensitive control scheme is hard to operate in cold and freezing conditions. Like most over-ear headphones, the Dolby Dimension trap heat under the ear cups and aren’t very breathable. Their design creates a decent seal around your ears and doesn’t allow much airflow, and you might notice a difference in temperature. This means you will most likely sweat more than usual if you work out with these headphones. Over-ear headphones are usually not very portable, and the Dolby Dimension are no exception. They don’t fold into a more compact format and the cups don’t swivel to lay flat and wear around your neck. They also don’t come with a hard case to protect them when you’re on the move, which is disappointing at their price point. They don’t come with a hard case, which is disappointing. Their pouch won’t protect them against physical damage and water exposure but is thick enough to prevent small scratches. The Dolby Dimension are very well-built headphones. The materials used feel high-end and heavy, giving a premium feel to the headphones. They feel very sturdy when in your hands, yet lightweight when you put them on. Most of the build is made out of metal, and the cups are covered with leather, which gives them a high-end finish. However, the headphones feel so heavy that an accidental drop on the ground could be damaging. 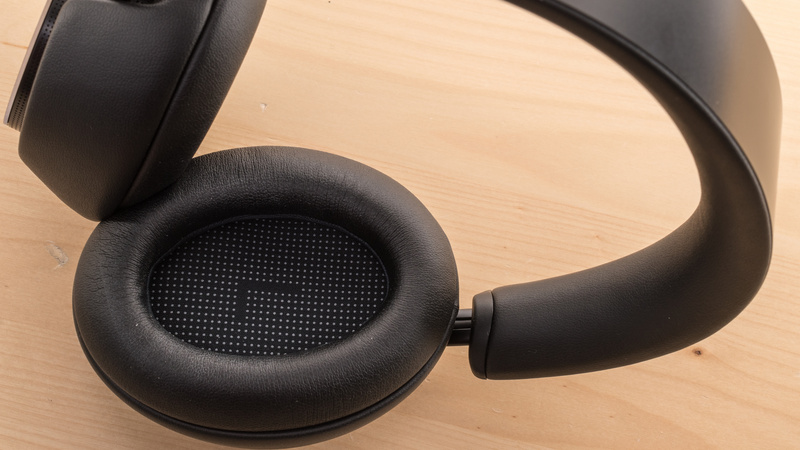 Overall, everything about these headphones feels well-made and should last you a while. 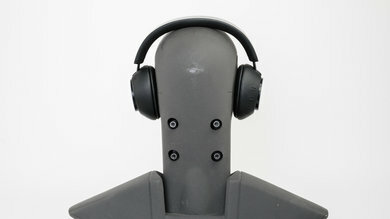 These over-ear headphones are quite stable. They aren’t too tight on the head, but the fit is stable and secure. You could wear them while jogging or at the gym without too many issues. However, more intense physical activities or lots of head movement will make them sway around and they could come off your head, especially when tilting forward or backward. On the upside, since they are wireless, you won’t have to worry about a cable being in your way, or accidentally yanking the headphones off if it were to get hooked on something. These headphones can’t be used passively with an audio cable. They come with a micro-USB cable that plugs into the dock or directly to the headphones. They also come with a power outlet adapter. 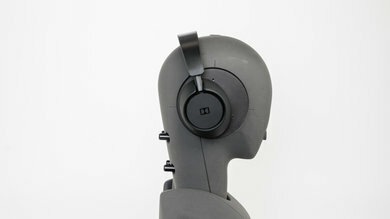 The Dolby Dimension are decent-sounding closed-back over-ear headphones. They have a punchy bass and a well-balanced mid-range, but the treble range lacks detail and brightness. Their bass is a bit inconsistent across users and doesn't have the deep rumbles of similarly designed headsets like the Bose QuietComfort 35 II or the Sony WH-1000XM3. Their mid-range is also a bit cluttered and forward, but on the upside, they have virtualization and head tracking features that help give them a more speaker-like and spacious soundstage. However, we don't have a test for DSP-created soundstage in our current test bench. Overall, these headphones will be versatile enough for a wide variety of music, but they lack a bit of detail and are on the darker side. The Dolby Dimension have very good bass. The LFE (low-frequency extension) of 25Hz is great. Low-bass is underemphasized by almost 2dB, which means these headphones slightly lack thump and rumble, so their bass may not be heavy enough for fans of bass-heavy genres like EDM, hip-hop, and dubstep. Mid-bass, responsible for the body of bass guitars and the punch of kick drums, is within 1dB of our curve, which is good. 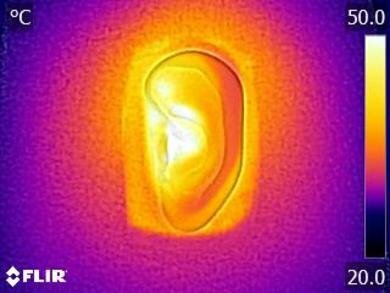 High-bass, responsible for warmth, is overemphasized by about 3dB, which will add a bit of boominess to the sound. The mid-range performance of the Dolby Dimension is great. The response throughout the range is slightly overemphasized, but it is flat and well-balanced. The 3dB of overemphasis in low-mid is the continuation of the high-bass, meaning vocals and lead instruments will sound cluttered and thick. Also, mid-mid is over our target curve by about 2dB, which will slightly nudge the vocals forward in the mix. These headphones might sound a bit too “mid-rangy” for some, especially if you have virtualization enabled. The treble of the Dimension is mediocre. The range is fairly flat, but there is a broad and deep dip between 4kHz and 8kHz, which negatively affects the brightness and detail of sibilants (S and T sounds). This will be mostly noticeable on vocals, lead instruments, and cymbals. The Dolby Dimension have a mediocre frequency response consistency performance. These headphones are prone to consistency issues throughout the range, especially in the bass range. The maximum variance measured across our five human subjects was about 8dB at 20Hz, which is noticeable. We also noticed that certain types of glasses could break the seal on these headphones and cause a drop in bass. In the treble range, the maximum amount of deviation below 10kHz is about 6dB, indicating that these headphones' treble delivery is rather sensitive to positioning. The imaging of these headphones is okay. Unfortunately, they show audible amounts of group delay in the bass range which results in slightly soft and loose bass, but this might not be audible for everybody. On the upside, the L/R drivers of our test unit were well-matched in amplitude, frequency, and phase response, which is important for the accurate placement and localization of objects (voices, instruments, video game effects) in the stereo image. However, these results are only valid for our unit, and yours may perform differently. The soundstage is poor. The PRTF graph shows a limited amount of pinna interaction and activation, and there is no 10KHz notch present either. 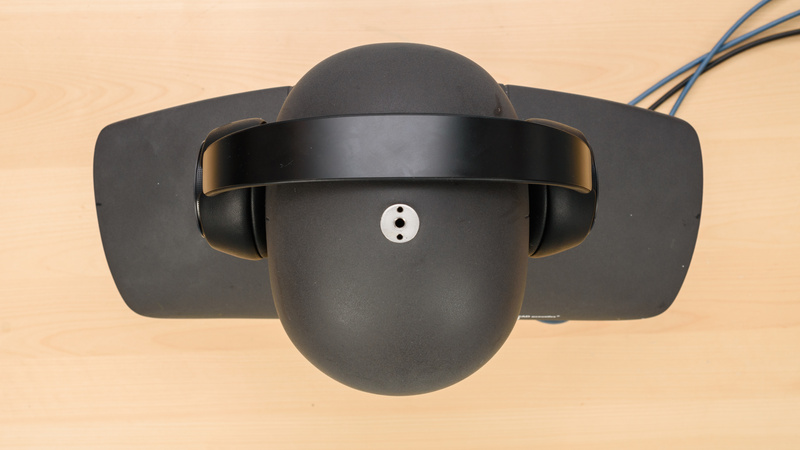 Since creating a speaker-like soundstage is dependent on an accurate and adequate pinna interaction, their soundstage will be perceived as relatively small and located inside the listener's head, as opposed to in front, and will be less open-sounding than open-back headphones. Like the Audeze Mobius, we measured the soundstage of the Dolby Dimension without their virtualization feature. This is a limitation of our test bench since we currently don't have a test to accurately measure DSP-aided soundstage. However, we perceived their soundstage to be noticeably better with virtualization ON and it adds a good amount of crossfeed. The harmonic distortion performance is average. The overall amount of harmonic distortion produced is relatively high, especially in the bass and mid-range. This could make the sound of these headphones a bit impure. However, there is not a big rise in THD under heavier loads, which is good. The peaks at 5kHz could make the treble of these headsets harsh and brittle, which might be fatiguing during a long listening session. The isolation performance of the Dolby Dimension is decent, but disappointing when compared to other high-end ANC headphones. They only do an okay job at blocking out lower frequency noises like bus engines, which would be useful while commuting. They'll be a decent option at the office, although they can be slightly leaky at higher volumes. You can mask more ambient noise by playing audio and raising your volume a bit without disturbing the people surrounding you too much. The Dolby Dimension have passable noise isolation that isn't as good as competing models like the Sony WH-1000XM3, the Bose QuietComfort 35 II, or the Microsoft Surface Headphones. 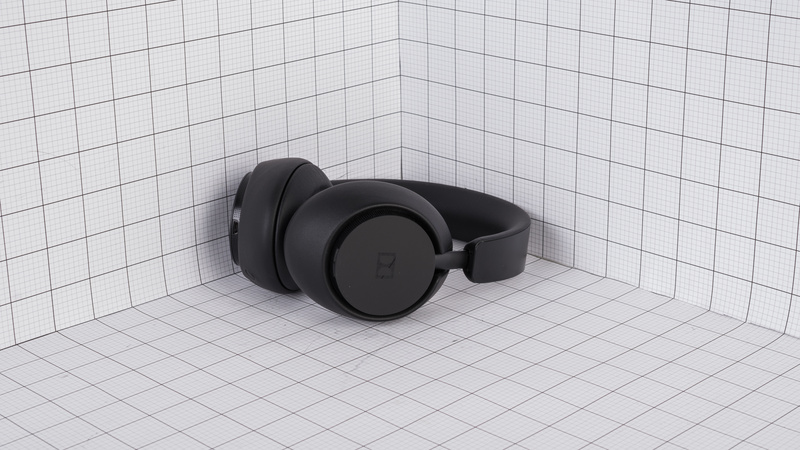 The active noise cancellation of the dimension achieves 10dB of isolation in the bass range, which means they're okay at cancelling out airplane and bus engine rumbles. However, they achieve 16dB and 38dB of isolation in the mid and treble ranges respectively, both values being quite good. This indicates good isolation performance for speech and sharp sounds such as S and Ts and fan noises like A/C systems. It should be noted that we had difficulty getting a tight seal on our dummy head, so we had to use elastic bands to hold them. This amount of isolation is pretty close to what we measured on human subjects, but some people may experience an even better isolation performance. The leakage performance is decent. The significant portion of the leakage is between 500Hz and 5kHz, which is a relatively broad range and mostly concentrated in the treble range. This means that the leakage will sound quite thin. The overall level of the leakage is not loud either. With the music at 100dB SPL, the leakage at 1 foot away, averages at 38dB SPL and peaks at 50dB SPL, which is the same as the noise floor of an average office. The Dolby Dimension have a sub-par integrated microphone. In quiet environments, speech recorded or transmitted with this mic sounds noticeably thin, muffled, and lacking in detail. In noisy situations, this microphone is able to separate speech from background noise in moderately loud places, like a busy street, but it may struggle in louder places. The integrated mic of the Dolby Dimension has poor recording quality. The LFE of 232Hz results in recorded or transmitted speech that is noticeably thin. The HFE of 1.7kHz suggests speech that lacks a lot of detail and presence. This result is worse than most Bluetooth headphones and will make speech recorded sound even more muffled. The integrated microphone has okay noise handling. 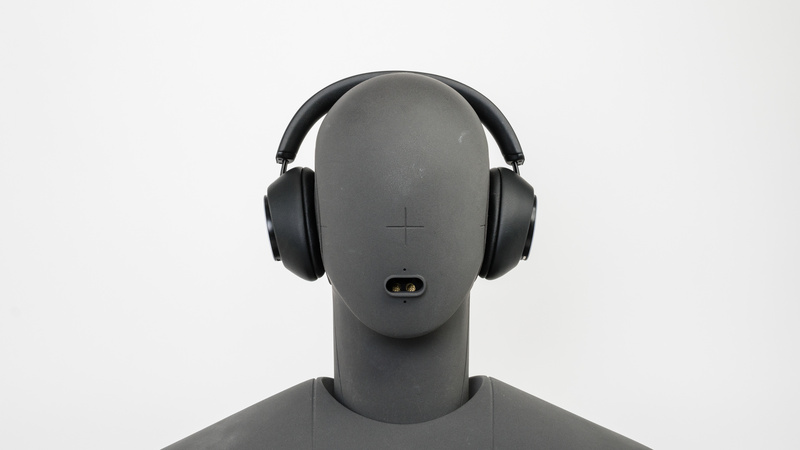 In our SpNR test, it achieved a speech-to-noise ratio of about 19dB, indicating it's best suited for quiet and moderately loud environments. 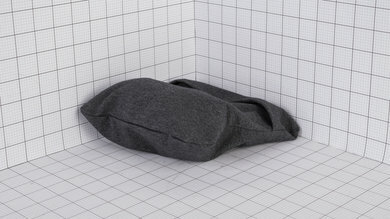 However, it will struggle to separate speech from ambient noise in loud situations. 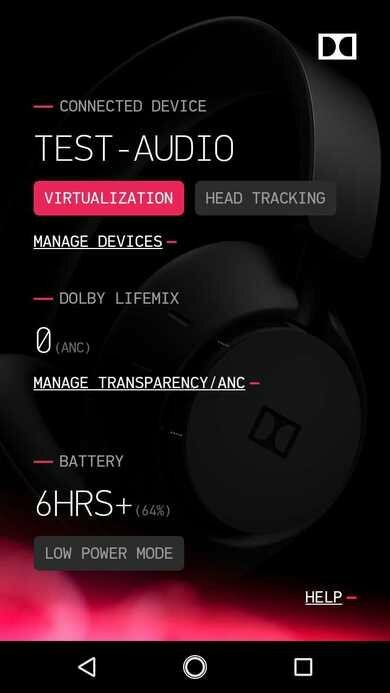 The battery life of the Dolby Dimension is disappointing when compared to other premium over-ear ANC headphones. On the upside, they have unique virtualization and head tracking features but we only measured 10 hours of battery life when not using them. With virtualization enabled, the Dolby Dimension have about 9 hours of continuous playback. This should last you a full workday at the office, but they might need daily charging if you listen to them all day long. They come with a sleek but lackluster app that doesn’t offer much control and customization options. The Dolby Dimension provide 9 hours of continuous playback with virtualization on and about 10 hours without it, which is lower than the advertised 16 hours. We tested the battery life without virtualization twice and got the same result of 10 hours despite 16Hrs being shown in the app. When compared to other high-end ANC headphones, this result is lower than expected and slightly disappointing. This should still be enough for a full workday, but you’ll have to charge them daily, especially if you want to use them while commuting as well. You can enter a standby mode by pressing the power button once or hold for 4 seconds to completely power off. Unfortunately, they don’t have a jack to plug in an audio cable to use while wired so you won't be able to use them passively like the Bose QuietComfort 35 II or the Sony WH-1000XM3 when the battery dies. However, you can enable a Low Power Mode to turn off all active features and LifeMix to slightly extend their battery life. The Dolby Dimension mobile app is a very nice looking and sleek app, but it lacks features and is slightly disappointing. You have control over the virtualization and head tracking features, and you can also control the amount of ANC and talk-through. You get battery life information, and you can also map the 3 physical buttons on the right ear cup to previously synced devices. Unfortunately, this app is lacking an EQ. You can’t customize their sound to your liking, but you can completely turn off ANC by enabling Low Power Mode. The Dolby Dimension are Bluetooth-only headphones and can’t be used passively with an audio cable, which is disappointing. On the upside, they have an amazing wireless range and are the first headphones we’ve reviewed that can connect to 3 devices simultaneously. However, their latency may be a bit high for some as they use the Bluetooth protocol, but you can reduce these delay issues by using an aptX-LL dongle. They also come with a charging dock, but you can also use a normal micro-USB cable and plug it directly in the headphones to charge them. Unfortunately, the dock doesn't act as a proprietary transmitter, which is disappointing considering these headphones are advertised for entertainment at home. 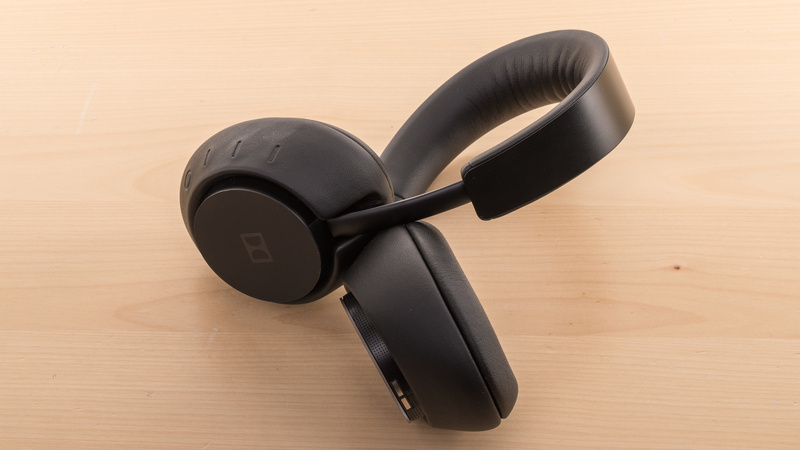 These are the first headphones we’ve reviewed that could connect to 3 devices simultaneously. 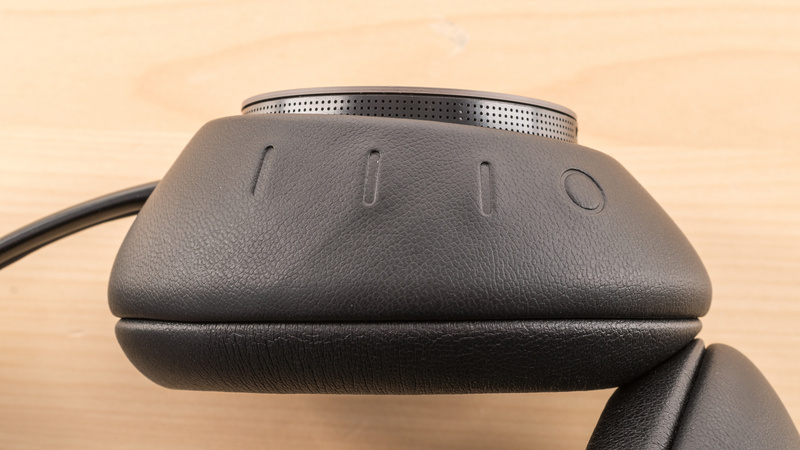 You can easily switch between the connected devices by using the physical buttons on the right ear cup. Unfortunately, the Dolby Dimension don’t support NFC for a quicker and easier pairing procedure. On the upside, they provide a clear voice prompt that lets you know which source you’re listening to. Unfortunately, the Dolby Dimension are Bluetooth-only headphones that can’t be used with a wire. 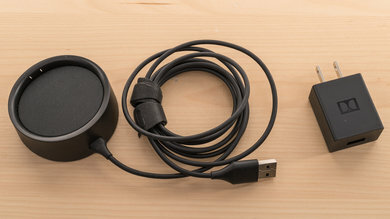 The Dolby Dimension come with a small circular USB charging cradle. The dock isn’t very portable, but you can still charge the headphones with a normal micro-USB cable, so you don’t have to carry it around. You can put the dock next to your TV for aesthetic purposes, but it isn’t mandatory to charge the headphones. Also, the charging station doesn’t act as a proprietary wireless transmitter, which is disappointing. The wireless range of these headphones is excellent. We got an impressive 69ft of range when the source was obstructed by walls. This means you should be able to walk around a small apartment or office without too many problems. However, wireless range is dependent on many factors such as your device’s signal strength, the thickness and material of the walls blocking the signal, interference, etc., so your results may vary. If you don’t have an aptX-LL dongle, these wireless headphones have 225ms of latency, which is average for Bluetooth headphones. You might notice a delay when watching video content on your phone meaning that what you will see won’t be in sync with the sound, but some devices and apps offer some sort of compensation. We also measured 170ms with an aptX-LL dongle, which was surprisingly high. We measured 77ms delay with another dongle, which is lower, but still a bit high for this codec. The Dolby Dimension are decent over-ear headphones that set themselves apart thanks to their virtualization and head tracking features, on top of being one of the most well-built and comfortable headphones we’ve tested so far. Unfortunately, their ANC isn’t on par with other high-end headphones we've tested and they have a relatively short battery life. If you’re looking for headphones for your commute, we suggest looking at our best noise cancelling headphones recommendations. 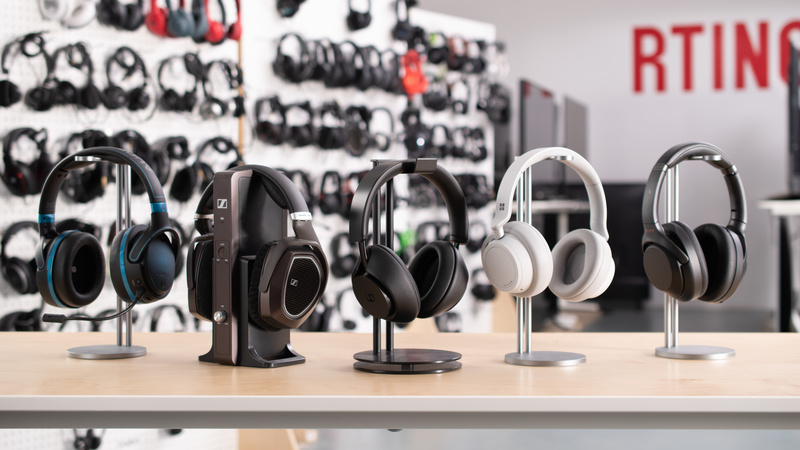 See also our recommendations for the best wireless over-ear headphones and the best closed-back headphones. The Microsoft Surface Headphones and Dolby Dimension perform quite similarly in most categories. The Surface Headphones have one of the most complete control schemes we’ve reviewed so far and their ANC feature is better than the Dimension’s, which makes them a better option for commuting. On the other hand, the Dolby Dimension have head tracking and virtualization features to enhance your listening experience, but don’t have an EQ like the Surface Headphones have. The Surface Headphones also have great wireless range and can also be used wired, even if the battery is dead. Okay for mixed usage. 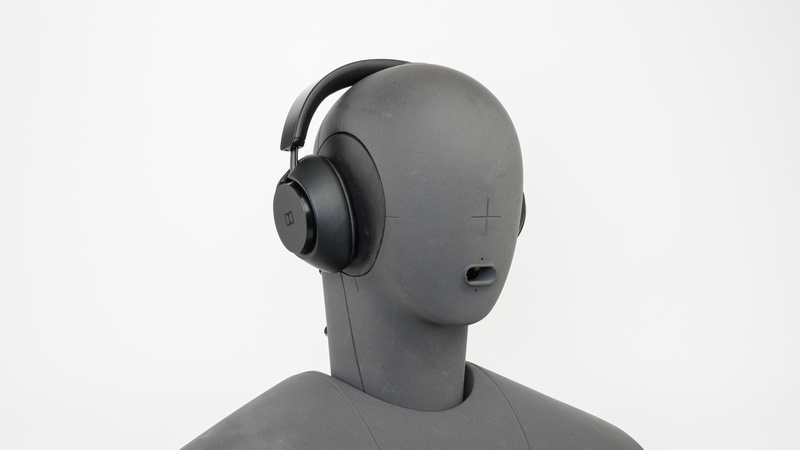 These headphones have okay audio reproduction for critical listeners but have nice virtualization and head tracking features which may enhance your listening experience, especially when watching video content. The Dolby Dimension have decent isolation performance to use while commuting or at the office. On the other hand, their bulky and full leather-covered design won’t be ideal for sports and is not sweat-resistant. Also, they have average Bluetooth latency, so they might not be the best option for watching videos or gaming unless you get an aptX-LL dongle, which still doesn’t give great results. Decent for critical listening. The Dolby Dimension have a punchy bass and a well-balanced mid-range, but the treble range lacks detail and brightness. Their bass is also a bit inconsistent across users, and their mid-range is a bit cluttered and forward. On the upside, they have virtualization and head tracking features that help give them a more spacious and speaker-like soundstage, but we don't have a test to measure this accurately in our current test bench. They also don’t have an EQ inside their app, which is disappointing. Decent for commuting. Their isolation performance is suitable for your daily commute. The Dolby Dimension don’t isolate low-frequency noises like bus engine rumbles very well, but when playing audio content it should be fine. You’ll also be able to wear these during long flights or car rides thanks to their comfortable build and 9-hour battery life. Decent for sports. While the Dolby Dimension are fairly stable for over-ear headphones, they might be too bulky for physical activity. Their leather-covered build won’t be the most breathable and sweat might degrade the coating. Decent for the office. They isolate a good amount of ambient chatter and A/C noises, and they are comfortable to wear for a few hours. They can also connect to three devices simultaneously so you can easily switch between your PC, tablet, and phone. Their battery life will be long enough for a full work day and they don’t leak too much as long as you don't blast your music at very high volumes. However, you might have to charge them more frequently than other similar headphones. Sub-par for watching TV if you don’t have an aptX-LL dongle to reduce the latency issues. They are comfortable enough to wear during a long movie or while binge-watching a show, and their great wireless range means you can use them from the comfort of your couch. You can also enable the virtualization feature to help you get more immersed in what you're watching. However, the fact that they are advertised as home entertainment headphones but don’t have a proprietary wireless transmitter in their dock is disappointing. Also, they can't be used with an audio cable to fully eliminate latency, or for passive playback when the battery dies. Poor for gaming. The Dolby Dimension headphones have too much latency for gaming. Their microphone is sub-par and isn’t suitable for online games. 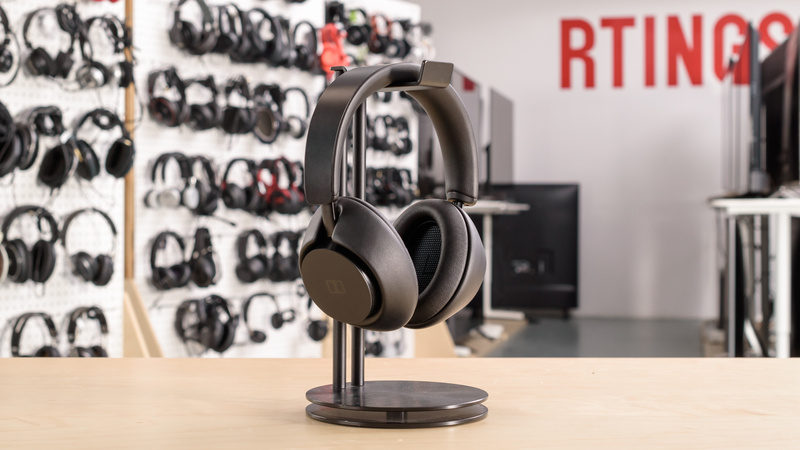 However, if you’re playing casual solo player immersive games and have an aptX-LL dongle, these headphones could be an interesting option thanks to their virtualization and head tracking features, similar to the Audeze Mobius gaming headset.